RALC’s programs aren’t possible without the amazing dedication of our volunteers. More than 200 community members give their time as volunteer ESL teachers, office staff, translators and special event volunteers. As such, new volunteers are always needed, as our programs continue to expand. All Richardson Adult Literacy Center classes are led by trained volunteer teachers who come from all walks of life, most of whom have had no prior teaching experience nor speak another language. The most important trait needed to become a volunteer teacher is a passion for helping others learn English. Teacher training and optional observation opportunities are provided by RALC before teachers are placed with students or a class. Training provides teachers with the tools needed and covers many areas to help guide you to a rewarding experience of teaching adult English language learners. ESL (English as a Second Language) classes are “English immersion”; teachers do not need to know a language other than English. Classes occur twice a week, with both daytime and evening opportunities available. 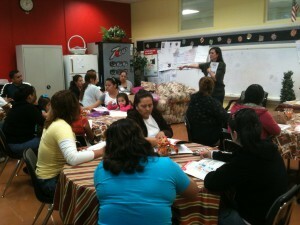 These classes are highly interactive and help to develop listening, speaking, reading, and writing skills. A substitute list is available for teachers who travel or have other occasional commitments that would conflict with their teaching time. Teacher Training Workshops are scheduled twice a year (January and August) and provide an opportunity to complete all training in one day. The workshops are held on a Saturday in Richardson. The next workshop will be Saturday, January 12, 2019, from 9:00am – 2:30pm. Click here to sign-up to be a volunteer ESL teacher. Want to find out more about being a volunteer ESL teacher? Visit our FAQ page. Opportunities are available to assist in the RALC office on a regular basis. Duties include answering the phone, preparing student materials and assisting with general administrative work. Shifts are typically two hours or four hours once a week. Email Katie Patterson at director@ralc.org if you are interested in being an office volunteer. Special event volunteers assist RALC by planning and working at various fundraisers and special events, as their schedules allow. Email Katie Patterson at director@ralc.org if you are interested in being a special events volunteer.